Eventholder is missing the good old RPG. Now he want you to create an awesome story! Easy there, it is not that simple. This time he will not tell you what he wants right away. He wrote down some puzzles, you will have to solve the puzzle so you can write your history. Here is the scroll Eventholder gave us. you can go blind by sand flows. Now I can rule until the end of the days. So the living can win in the battle field." There are three words that MUST appear in your history. Each verse is a puzzle to one word. First verse is a city; Second verse is a NPC; Third verse is a weapon. When you have discovered all the three words you will write a story. as long as you use the three words. -Puzzles can have more than one correct answer. - You must create a comic story with the discovered words. - Story MUST contain the three words hiden on the verses. - Story must be Tibia related. 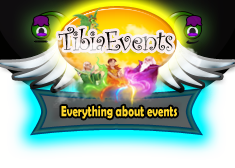 You have to tell a Tibian story, adventure. You can use real tibia characters, worlds, etc. - We won't be judging your talent with pictures neither your english. Only your creativity. - Please inform us the name of your character and the world. The contest starts Jan 30 2019 - and ends on Feb 20 2019 23:59 Cet. Time to solve a quest! When you say "You have to tell a Tibian story, adventure." you mean it has to be something that you can do ingame or can I be adventurous with fantasy as long as it fits the Tibian Universe? Is there a date for the results? Quote from zyrus Is there a date for the results? Hello we cannot say any date that depends on how quickly our team and cip votes. I was expecting the correct words to be posted at the end of the submission phase as stated in the brief. Also, can't wait to see the other stories. Hey mate, answers and entries posted! Quote from argenisg I was expecting the correct words to be posted at the end of the submission phase as stated in the brief.